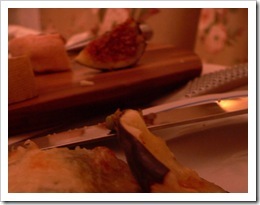 When I brought these to the table, Beth instantly took a picture and sent it to her husband Tom. As he was on stage trying to make people laugh at the time, I’m sure he was thrilled. It was my turn to host my book club. Normally, we have a wild and wonderful smörgåsbord, with everyone bringing a dish, but what with it being at my house and me being a control freak and everything, I couldn’t resist making the whole meal. As a nibble to go with drinks, I made warm Rosemary Cashews from Ina Garten’s Barefoot in Paris. They’re so simple, they’ve become a staple in this house – as essential to the cocktail hour as ice and good vodka. I scattered 500g of unsalted cashews on a baking sheet and toasted them at 180C/350F/Gas mark 4 for eight minutes or so until they were golden and then tossed them in a tablespoon of melted butter, a tablespoon of flaky sea salt, two teaspoons of light Muscovado sugar, two tablespoons of finely minced rosemary and half a teaspoon of sweet, smoked paprika (Ina uses cayenne, but I didn’t have any in the drawer, so paprika it was). Serve warm and watch them vanish. To start, I made a quick salad of leaves dressed in mustardy vinaigrette and put a couple of little toasts topped with grilled goat’s cheese and some finely sliced pickled sweet chilli peppers scattered over the top. For our main event, of course it was the glorious boeuf bourguignon with boiled fir apple potatoes and buttered peas (thank you, Louisette Bertholle). 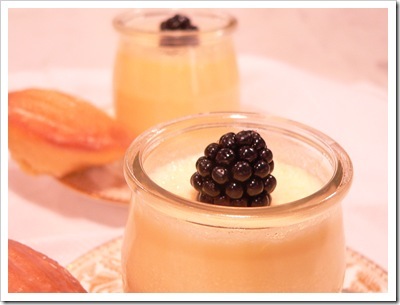 As a sweet finale, I made lemon posset, that most traditional of English puddings. To create a little entente cordiale on the plate, I served them in those little glass yoghurt pots I hauled back from France in the summer and David Lebovitz’s flawless Lemon-Glazed Madeleines on the side. Just like the boeuf bourguignon, they were so meltingly delicious, they sent me into obsessive-compulsive overdrive and I couldn’t resist making them again the next day. I took a batch to the park as a Friday treat for my 9am dog walking posse (pack?) and they vanished quicker than you can say ‘fetch’. My second batch of madeleines in two days. PS We read Raymond Chandler’s Farewell my Lovely. By some miracle, when Séan came home from the football (Arsenal 2 Olympiakos 0 – come on you Gooners!) at 10pm, we were actually talking about the book. I made 75 of these for Paula and Jack’s wedding a few weeks ago. They’re the perfect dessert in my opinion, tart and sweet, rich but refreshing, so simple to make and yet they taste as though you’ve spent hours in the kitchen. Also, you can make them the day before, which is always a good thing. Pour the cream into a large saucepan (it will bubble up very enthusiastically – you have been warned) and add the sugar. Warm gently, stirring to dissolve the sugar, then bring to the boil and boil for exactly 3 minutes, without stirring. Remove from the heat and whisk in the lemon juice. Strain the mixture into a jug then pour into 6 small glasses. Cool, cover then refrigerate for 4 hours before serving. Well if I came along to that book club I would think I had died and gone to heaven. Dana – I do hope you give them a go, they're fun to make and look quite impressive with their pretty glaze. Catherine – How lucky you are to have local lemons! Angels and Urchins – 'Lemons, cream' is surely one of the most promising shopping lists ever? Karen – We DO discuss the books, eventually (and often shamefully briefly…). More more MORE! Where are you? Love it all. Hope you're off having fun, but please post again soon. Your table looks so inviting. I agree, I don't know how you get around to discussing your book. Your posset looks delicious. Don't understand how you managed to discuss anything at the book club – surely you just lay on the floor groaning, 'tooo full, give me more POSSET'! Do love that word. If I could spell the word for 'sounds like its meaning' I'd write it, but I can't, so will just say, 'unctuous' and head off to buy some lemons. And cream. I keep threatening to make Julia's Boeuf…and that lemony gorgeous dessert would be a perfect light, but not-too-light finale. Can't wait until my neighbor's tree starts bursting with lemons again. Those madelines look divine! I haven't broken out the madeline pan in MUCH too long. You've inspired me! Marty – Aren't they fab? I had yogurt for breakfast every day for three weeks so I could collect a nice little stash to bring home! They're great for little trifles, chocolate mousse, tiny posies of flowers or herbs for the table. Lady P – So pleased to hear you're feeling better dear. I look forward to fall images to fall in love with. 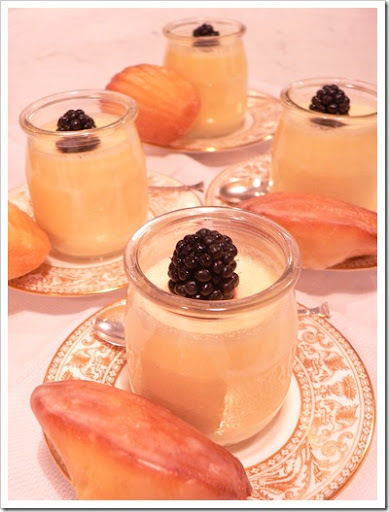 Do try making the possets – they're so simple and so delicious. Karen – I LOVE Angels (and devils) on horseback, so that's definitely a date. I thought you might enjoy the little pots, as I know they are one of your favourite things. Nora – You know, one of my friends (who sadly lives a bit too far away for me to join in)has a cookbook club. They pick a classic or a new cookbook every month and each member cooks something from it. I love my bookclub posse – we met because we walk our dogs in the same park every morning, come rain or come shine, so it's rather nice to get together out of the cold, wind, rain and really chat. About the book, of course. And shoes, husbands, kids, dogs, local scandal…everything really. We're all different ages too, from 20s to 60s, which I love. Oh my God, that sounds like such a perfect evening. 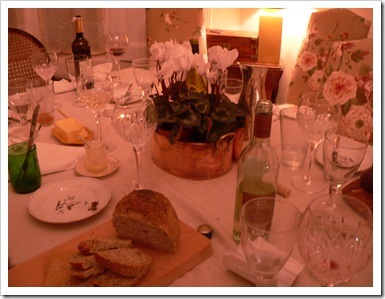 Rosemary cashews, beef bourguignon, lemon posset, madeleines and Raymond Chandler! My book group just goes down the pub and now I feel decidedly shortchanged. Maybe it's time to start a culinary version – and send everyone to this page to see what can be achieved! I remember my doubts when you hauled the yoghurt pots from France and here I am, wrong again. 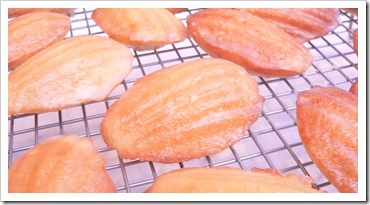 The look lovely and the madeleines look good enough for Proust. I wish I were in your book group to argue the mysoginistic mean- street elegance of Raymond Chandler. And eat youe madeleines. ahhhh = that is heaven in a wee little yogurt glass – i live to read english authors, and have run into the term “posset” before. always wanted one. love lemon. now i want a lemon posset in a pot. I love the little yogurt pots!!! !